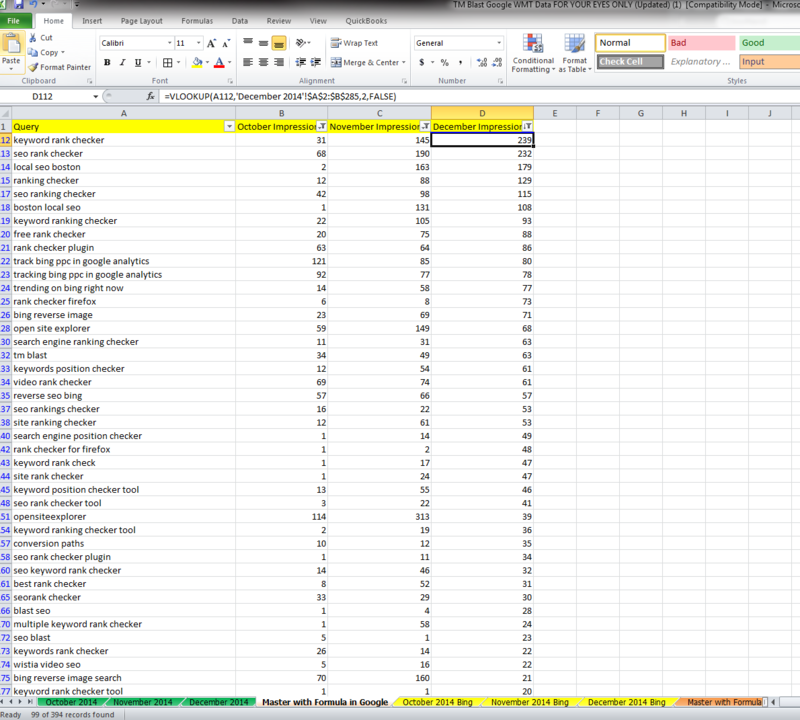 This is something that I think is just as useful (if not more useful) than a simple keyword ranking report. 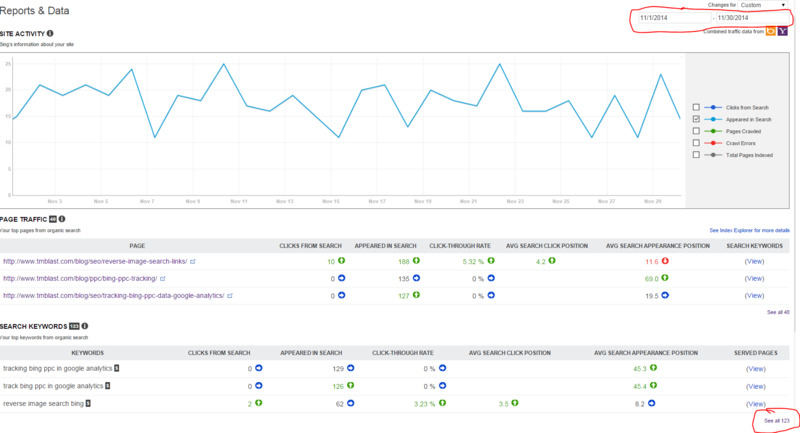 Exporting your Webmaster Tools data from Google and Bing is a fantastic way to see how your SEO strategy is actually performing. I simply look at the impressions, but you can look at whatever you would like. Here is what I do. Here we have a simple chart of data from WMT. Now I have exported my data into a CSV file. 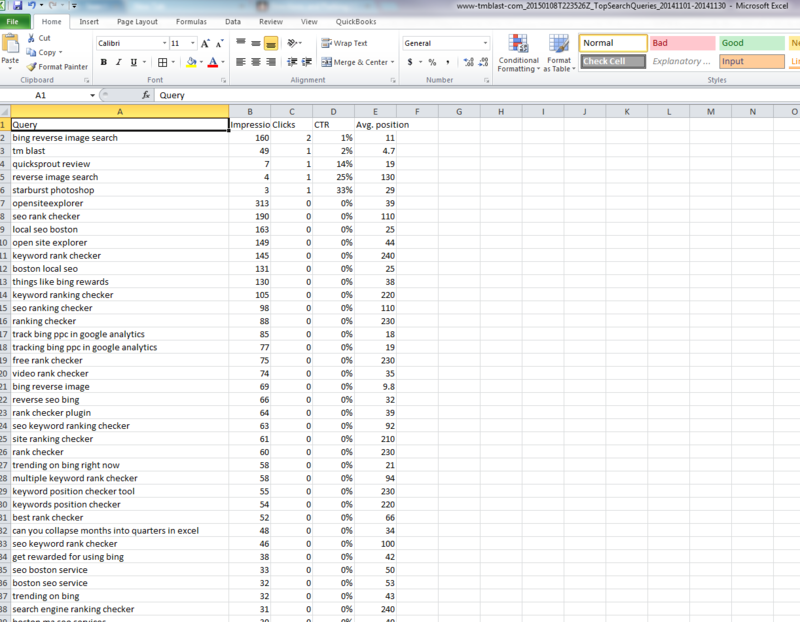 Here is what my data looks like in the excel file. We just repeat the same steps as before. 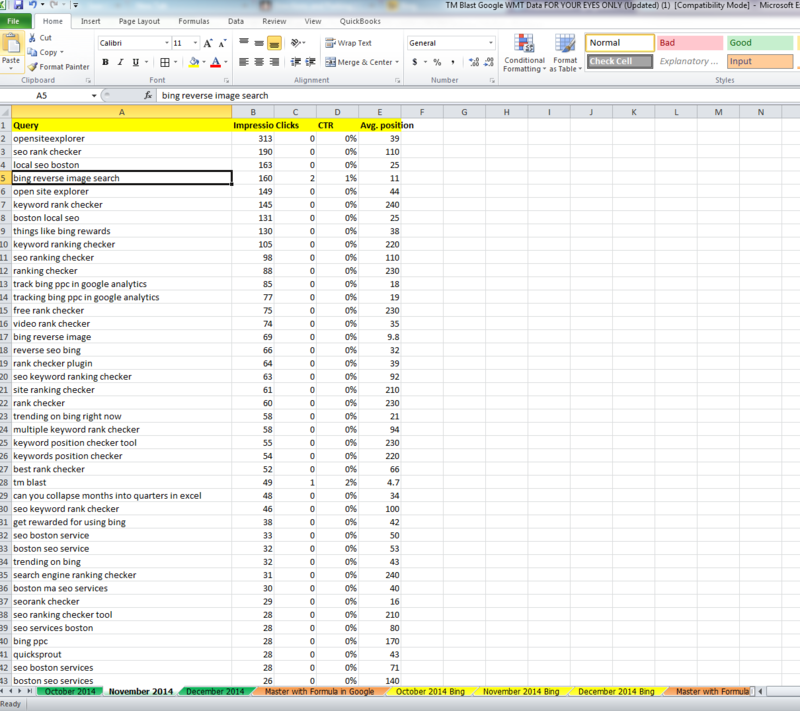 Now we have 2 months (technically I have 3, but this is just an example) of data in our excel file. You will notice that I have a two tabs that are in orange that say Master with Formula. One tab is for Google and the other is for Bing. I took all three months of data (October, November, and December) and made a new tab to look something like this. This for me is easier to see how the keywords are looking month over month. Yes, there is a seasonal factor, but this helps give you an idea let’s say year over year with your SEO strategy. What is great with this approach is that is allows me to really focus on specific keywords for my website. 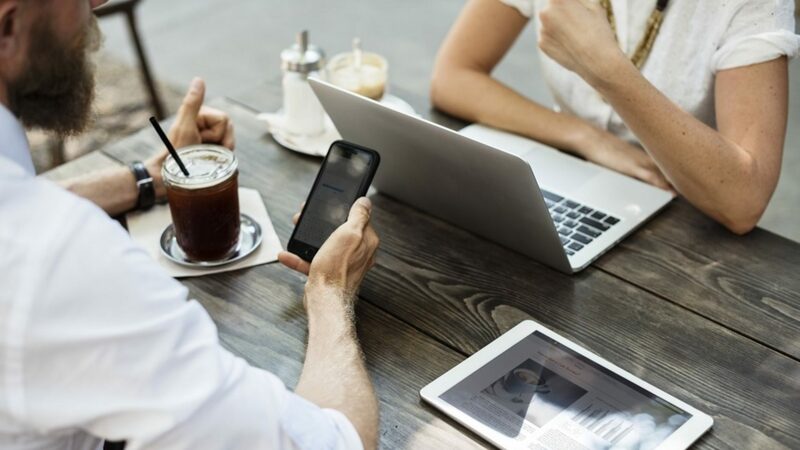 More impressions simply means a positive movement in Google rankings. This also helps me with semantic keywords. 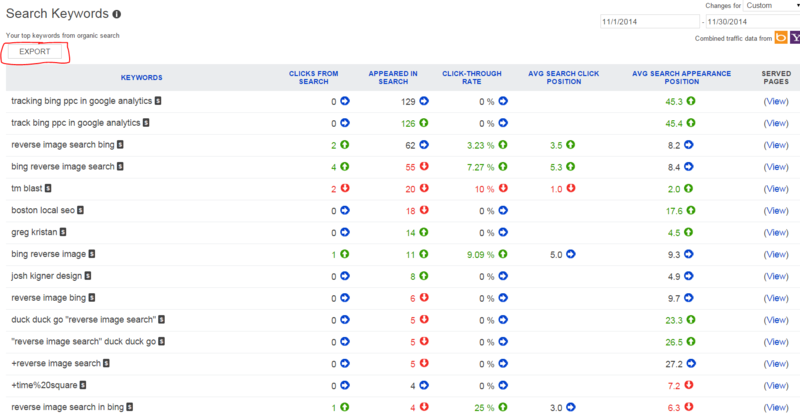 A ranking report will focus on very specific keywords because they have search volume with the Google Keyword Planner Tool. Using GWT (Google Webmaster Tools), I can get a better understanding what people are actually searching for. This allows me to then go back into pieces of content to add more semantic searches. How Did I get all of the Data? I simply used a VLOOKUP formula to get all of these data points. This virtually took anytime for me to do. What is great is that I can then change my filters around to list the keywords from A-Z or have November as the lowest to highest. The data points will never change, just the sorting will. The steps for Bing are exactly the same as Google. 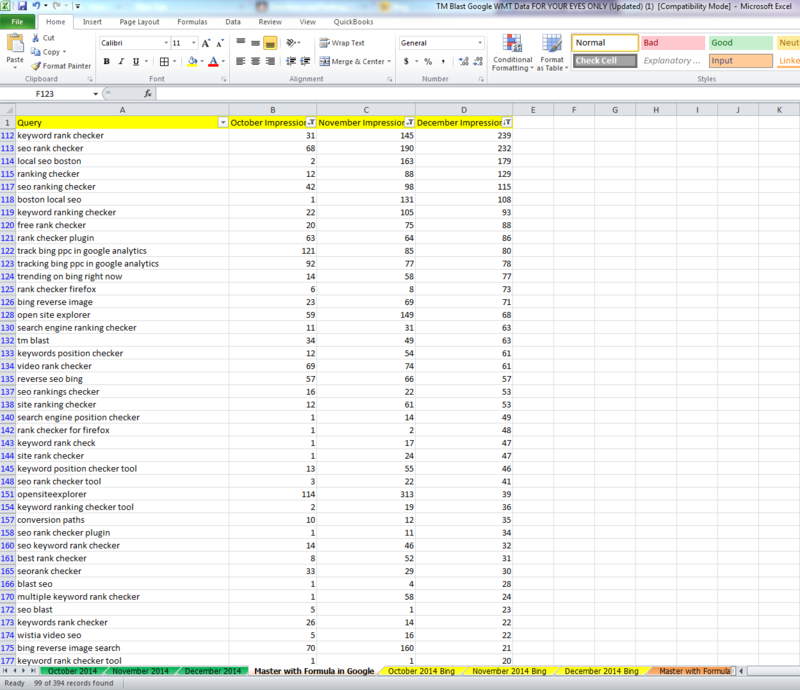 Here I have my dashboard for the last 3 months of keyword data. I repeat the steps like I did in Google. I think doing this once a month will be really beneficial for anyone looking to maxamize thier search engine optimiaztion strategy. Having the data in a simple to read Excel file is the way to go. 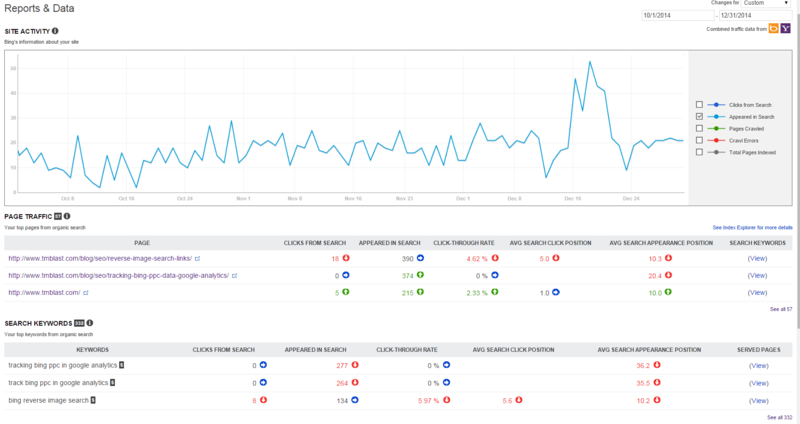 Bing Webmaster Tools in my opinion is really messy and is hard to read month over month. Google is better, but again, they both have a hard time really seeing how your keywords are performing. Another reason to do this type of strategy is to see new opportunities. I find it really interesting to see what is ranking in Google and in Bing. Sometimes, I might notice a keyword is performing well in Bing, but not in Google. I know that if Bing and Yahoo make up about 10 ish percent of the U.S search market, then I can assume that optimizing that keyword for Google could be a great boost for my website.